A tributary of the Derwent River, the Tyenna River’s fast flowing waters offers up great fishing regardless of your ability and experience. Every year, the Tyenna delivers some amazing trophy fishing, but there’s plenty of mid-sized brown and rainbow trout for the taking whatever your fishing method. Autumn and Summer provide the best fishing in the Tyenna, when the tides are low, and wading will improve your access – as there is a bit of overgrowth. You will need an inland angling licence to fish in the Tyenna, but kids under 14 are exempt, so it can be a great place to get the little ones involved. And with a portion of the river flowing through the Mt Field National Park, this fishing spot will give you a chance to experience some of Tasmania’s most beautiful natural environment. 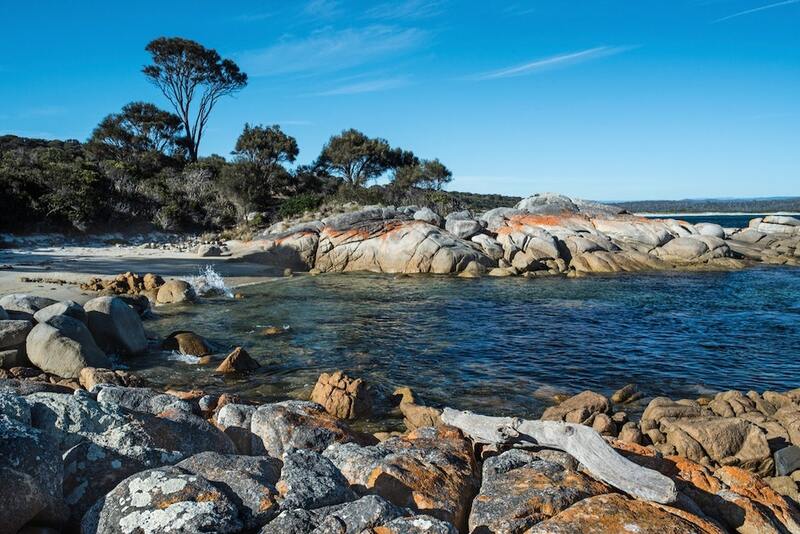 Nestle on St George’s Bay, St Helens is located on Tasmania’s east coast. Sheltered and protected from the westerly winds, with mild weather even in winter, the waters off St Helens provide the perfect environment for both estuarine and off-shore fishing. Land based anglers can expect to hook snapper and King George whiting, while those looking to brave the waters in a boat can find calamari and Australian Salmon, with some lucky anglers even managing to nab a mako shark or two! With five boat ramps servicing the area, there’s always plenty of room for all – and if you want to hit the water, but don’t have a boat of your own, numerous charter companies operate in the area. Arthurs Lake, located in the Central Highlands just an hour from Launceston, is a trout fisher’s dream. A premium still-water trout fishery, the waters of this man-made lake run very clear, with plenty of large weed beds and dead trees creating the perfect environment for trout to thrive. With relatively consistent depth levels, the boat ramps at Jonah Bay, Pumphouse Bay, and the Dam wall all offer easy access for good fishing. The best time to tackle Arthurs Lake is early morning, when the trout are out and feeding on the midges from the night before. The trout tend to head to deeper waters as the day warms up, so get in early! Given the easy waters, and even easier trout fishing, Arthurs Lake is the perfect place for anglers just dipping their toe into the hobby. A hot spot for internationally recognised game and trophy fishing, the waters of Pirates Bay are absolutely teeming with great catches just waiting for you to drop a line. Given the relatively short distance offshore of the continental shelf, the waters off Pirates Bay are very deep, with water depths of 100m just off shore are common. This creates an ideal environment for large game, particularly Blue Fin Tuna, with several world record catches caught in these waters. For those heading out, there’s also plenty of ocean perch, barracouta, and yellow tail kingfish to be had. If you’re looking for some easy land fishing, you’ll have no problem hooking yourself Australian salmon, flathead, and even squid. A guide to fishing in Tasmania wouldn’t be complete if the mighty Derwent didn’t get a mention. With plenty of spots providing great fishing, the Derwent is a must for all anglers headed Tasmania bound, and could have an article all of its own. But we’ll whet your appetite with just a few of our favourite spots along the Derwent. From Summer to Autumn, Piersons Point – Iron Pot, gives fantastic blue warehou yields. Year ‘round, you’ll find salmon, trevally, and the occasional good run of squid. Sandy Bay is great for fishing whether on land or in a boat, and is one of the easier spots for anglers – so is a great place for kids and teens, as well as those without a lot of experience. With a playground, barbecue facilities, and a great spot for picnicking, Sandy Bay is perfect for a family day of fishing. With plenty of jetties along the river, and plenty of sheltered spots, the Derwent River offers a fantastic fishing experience throughout the year. Some of the areas of the river are protected, and licensing requirements vary, so check out this easy to use guide from the Department of Primary Industries before heading out. If you love to fish, and are thinking of heading to the mainland, then don’t forget to check out our fishing guides to other cities in Australia: Adelaide, Sydney, Perth and Melbourne.